Gallium-labeled prostate-specific membrane antigen (PSMA) PET/CT is gaining ground in primary prostate cancer staging, delegates heard at last week’s online meeting, Conference on Hybrid Imaging Live (CHILI), held in Barcelona, Spain. This is an article by AuntMinnieEurope.com, read it here. During the conference, streamed live from Barcelona on 26 October and viewed free of charge, Prof. Clemens Cyran, chair of the European Society for Hybrid, Molecular and Translation Imaging (ESHIMT) education committee, detailed the specific diagnostic and therapeutic implications of PSMA PET/CT in the workup and management of prostate cancer, one of the most frequent cancers in men in the West and which has a 30% recurrence rate after radical therapy. A 65-year-old patient with radical prostatectomy and pelvic lymph node dissection for prostate cancer (GS 4 + 3, pT3bN0Mx), adjuvant radiation therapy, and targeted pelvic lymph node dissection, biochemical recurrence after five years (prostate-specific antigen 0.3 ng/mL).As cause for biochemical recurrence (prostate-specific antigen 0.45 ng/mL), a single iliac lymph node metastasis was detected using GA-68 PSMA PET/CT. Images courtesy of Prof. Clemens Cyran. 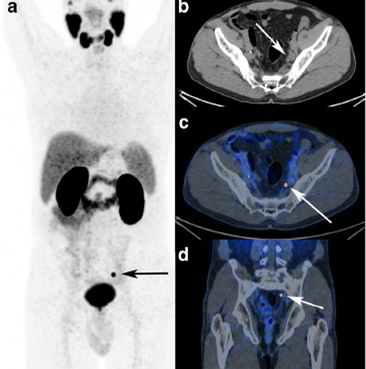 “PSMA PET/CT significantly increases the sensitivity and specificity for detecting metastasis in primary staging, and also for biochemically recurrent disease with respective therapeutic implications. It therefore has the potential to serve as a guidance tool in clinical decision-making,” he told AuntMinnieEurope.com. He described how innovative PSMA ligand radiotracers bind to a 750 amino acid trans membrane protein overexpressed in prostate cancer cells, enabling the assessment of metastasis at a molecular level. “The particular value of PSMA PET/CT has been shown in the detection of small lymph node and bone metastases that would go undetected by conventional CT. First studies show that a metastasis-directed therapy approach based on PSMA PET/CT improves patient outcome,” noted Cyran who is professor of radiology and section chief of hybrid and molecular imaging at Ludwig Maximilian University (LMU) in Munich, Germany. However, he underlined that most available studies are of retrospective design and report smaller patient numbers. Larger, prospective, multicenter studies are currently underway to provide higher quality data to investigate hypotheses including whether or not PSMA PET/CT has a higher diagnostic accuracy than standard-of-care imaging and if PSMA PET/CT should be used as a first-line diagnostic test with significant management impact and consecutive economic benefits. Currently, PSMA PET/CT is available predominantly at university centers. However, with rapidly increasing evidence of its diagnostic capabilities, it is likely to gain broader clinical application in the near future, he noted. When asked by the session moderator, journalist and broadcaster Karen Coleman, how long it took for the translation of this novel tracer to clinical application, Cyran replied it only took 18 months between the first publication on the tracer until it was established in clinical reality at LMU. “Looking at the time it takes to send a radiological contrast agent through phase studies, this is very impressive and helps us to have some hope for innovations that may be coming,” he told viewers during the meeting, organized by ESHIMT and European Society of Radiology (ESR). Cyran further explained it was possible to get approval in such a comparatively short time due to Germany’s legislation that allowed PSMA’s clinical adoption for compassionate use. Such legislation gives doctors the option to use novel tracers to change the way therapy and diagnostics work, making the process more comprehensive and efficient for the patient, he added. Using the Slido application integrated into the streaming link, viewers could send questions to the presenters to be raised during the roundtable discussion at the end of each session. One viewer wanted to know about the rule of prostate cancer recurrence detection by PSMA PET/CT immediately after radiotherapy. “We know on a certain level a reactive uptake of PSMA can also be present by means of inflammation … This can raise the insecurity in differentiation of possible lymph nodes and lymph node metastasis. The situation is always better if you are not in the immediate postradiotherapy stage or postoperative setting,” Cyran responded. Co-presenter Dr. Harun Ilhan, nuclear medicine physician at LMU, believed this question concerned clinicians and uro-oncologists, more than imaging facilities, as follow-up after radiotherapy is not based on imaging but on prostate-specific antigen (PSA) measurement. At LMU, if a patient does not show proper PSA response after therapy, particularly surgery, then specialists may try to detect if there is evidence of lymph node metastasis. However, in the radiotherapy setting there is little data on ideal time lapse before PET/CT, but it is clear that some time span is needed for the dose and radiation therapy to show its impact on the lymph node metastasis, he noted. “No one would recommend performing a PSMA PET/CT one week after radiotherapy,” Ilhan told listeners. Cyran agreed: “The data available points to performing the PSMA PET/CT scan before you plan the target volumes. So perform the scan before you do the radiotherapy,” he said, illustrating this with a study that showed a change in 87% of target volumes following PSMA PET/CT. Speaking more broadly about hybrid imaging, he further stressed it was important to bring education to the desktop, obviating the time and financial costs of travel and hotels. “Even with a busy schedule, most doctors can spare 90 minutes to connect to an online conference and simply listen in to the session that interests them and is most adapted to their personal level of training,” Cyran said. The CHILI meeting was sparked by recent European Union (EU)-wide surveys conducted by ESR and ESHIMT sent to radiology and nuclear medicine departments on the status of training in hybrid imaging. Another survey was sent to different European health ministries about their view of the modality. Both ESR and ESHIMT agreed hybrid imaging education was too heterogeneous and needs were insufficiently met. The meeting’s program started in the morning with the basics of hybrid imaging aimed at first-time users or residents and moved to more sophisticated areas of the technique throughout the day, via a session later in the morning on its main use in oncology, and a session on other emerging indications in the early afternoon. These were followed midafternoon by a session on the future of hybrid imaging that included a presentation by Prof. Irène Buvat about the added value of artificial intelligence for both PET/MRI and PET/CT. How is hybrid imaging faring across Europe, and are ongoing turf battles between radiology and nuclear medicine getting resolved? Philipp Ward from AuntMinnie talked to Thomas Beyer, PhD, MBA, to reflect on these issues and on his first year as president of the European Society for Hybrid, Molecular and Translation Imaging (ESHIᴹᵀ), as well as the next 12 months ahead. Visit the ESHI booth on the entrance level and join our sessions at ECR 2019. Among many applicants, Dr. Mahmoud Rezk was chosen as our first hybrid imaging fellow in 2018. He was granted a 3-months-fellowship at Umea University (Sweden).